VICTORIA, BC – Through a range of services offered by the nutrition department at the Canadian Sport Institute Pacific (CSI Pacific), registered-athletes are provided with the resources to perform at their best in the quadrennial leading up to 2016 Rio Olympics and Paralympics. When registered athletes first meet with the nutrition staff at CSI Pacific, they will go through an initial assessment to help them get an understanding of athletes’ goals, training schedule, volume of work, and competition plan. Sport dietitians will try to find out as much information about athletes before making any recommendations. They monitor basic height and weight along with body composition data, get a medical history, find out if they follow any specific diets, ask what their supplementation pattern is, as well as look at how they are recovering after sessions and what their nutrition strategies are in training and competition settings. Sport dietitians also spend as much time as possible in the daily training environment where they can examine the hydration and fueling habits of athletes. 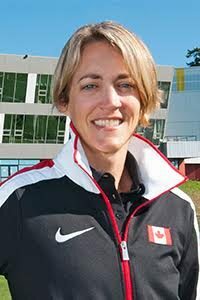 In Victoria, that means Susan Boegman and Ashley Armstrong work closely with the lightweight women’s and heavyweight men’s rowers, men’s and women’s rugby sevens teams, paratriathlon athletes, Victoria-based swimmers, as well as NextGen rowers and cyclists. Along with the responsibilities of working with as many as seven different provincial and national sports and balancing the unique mandates each one has, Armstrong and the rest of the nutrition team offer a variety of educational tools to support athletes in maintaining their nutrition and recovery needs. One of the most rewarding programs for Armstrong at CSI Pacific is the Podium Fuel meal program, which she oversees. As part of the program, four of CSI Pacific’s major sports receive pre-training and recovery meals that helps athletes live on a budget while maintaining the proper intake necessary to compete. In addition, the nutrition staff will also take athletes on grocery store tours, run cooking classes, as well as develop meal plans. Once the foundation is established with an athlete, specific nutrition interventions are fine-tuned and plans for travel and competitions are developed, practiced and adapted. While the tasks can appear seemingly endless for the small nutrition team, Armstrong says they are able to make a significant impact because of the large support network at CSI Pacific. The Rio 2016 Olympics begin on Friday, August 5. Follow along with CSI Pacific on Facebook and Twitter for news and information about BC-based athletes competing at the games.